Back in June I posted about my new bookshelves that I was so proud of - you can see that post here if you missed it - and how I was excited to finally unpack my many boxes of books that had patiently been waiting in storage for the past eight months. The boxes have been unpacked and the shelves are finally full, so I thought I would share some photos of my bookshelves with you! Seeing other people's bookshelves is one of my favourite things to do when I go over to someone's house. 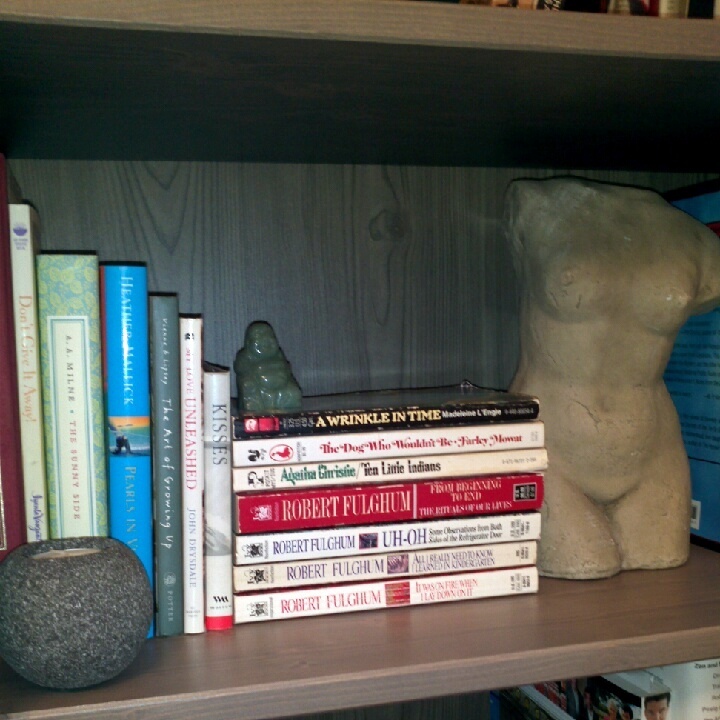 It's interesting to see what others like to read and what books they choose to keep and display on their shelves. If I didn't have a husband, I probably would have left the shelves all uneven and a potential safety hazard like that. Good thing I do have a husband, because now the three pieces look more like one big piece. My library in all it's glory! I actually purged approximately 4 large boxes of books this time around. I used to keep everything I have ever read, but now I get rid of the books I didn't like and would therefore either never re-read or never lend to someone else to read. I also purged a lot of books that I've out grown - like all the Candace Bushnell books (sorry to any Candace Bushnell fans!). 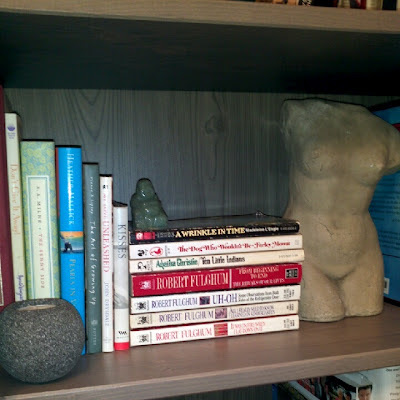 Right now, I've organized the books alphabetical by author, with all genres mixed together. I've always wanted to try this, but I find it hard to really customize my shelves this way. I like to organize the books based on their appearance or colour. Either way, I feel it's an evolving process and will continually change as I accumulate more books! 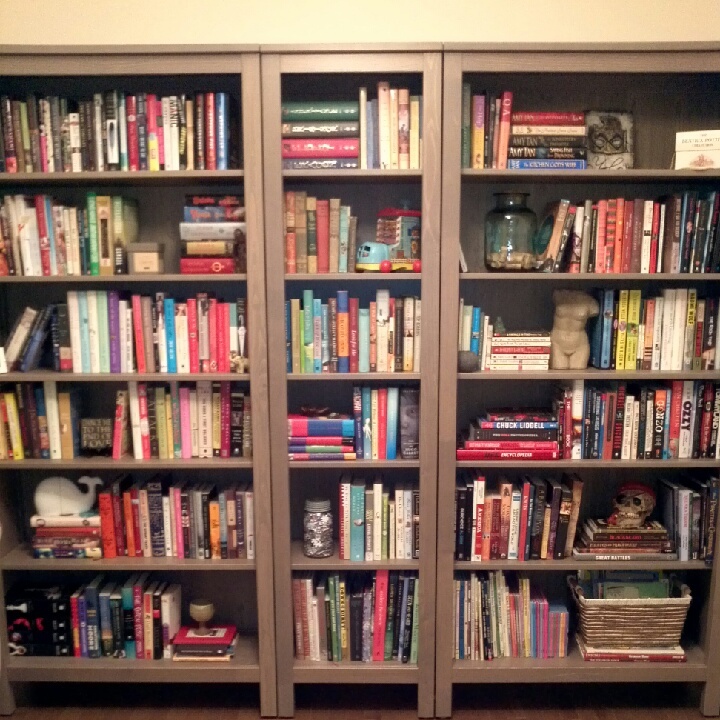 I also, reluctantly, had to give the husband two shelves for his books (right side, fourth and fifth shelf from the top). 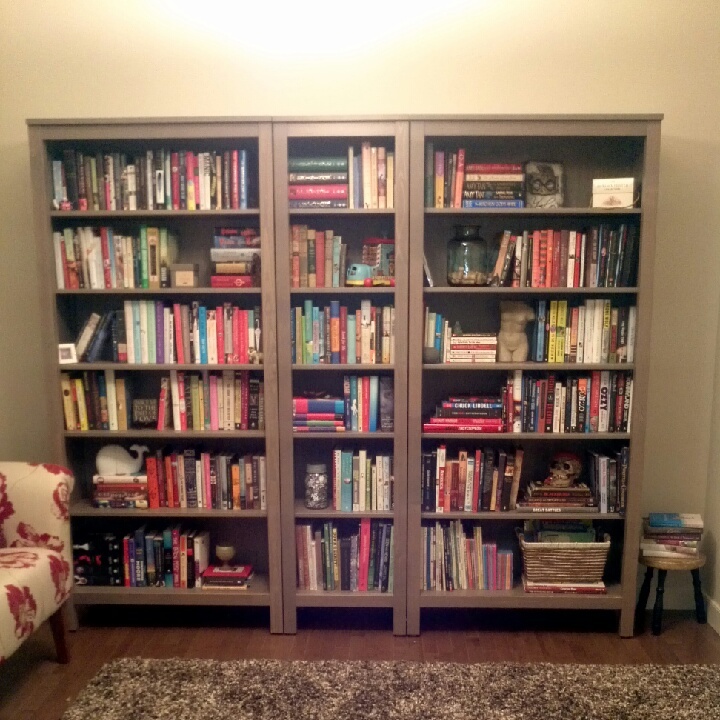 He's not even a reader, yet he had almost enough (unread) books to fill two shelves! My beloved thrift store finds, including an old Fisher Price 'The Woman Who Lived in a Shoe' Shoe. My collection of well-loved paper-backs that take me back to my young teen years. My husband and I LOVE pirates and will pretty much buy any pirate book we ever come across! 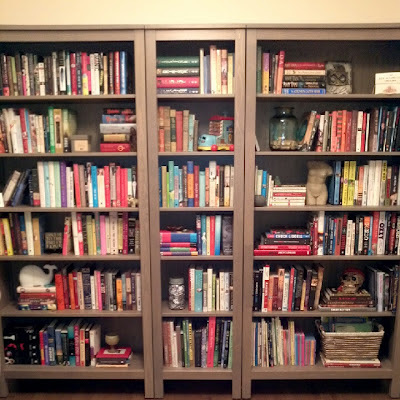 How do you organize your books on your bookshelves? Do you have a system? 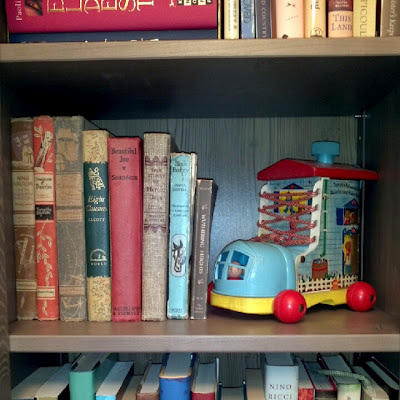 Which books do you decide to keep, and which ones do you decide need to go? Brie!! I'm sooo jealous! (<-- I've been saying that a lot lately, haven't I?) They're perfect and so pretty! I have a matching set of bookcases, but they're very light coloured and not very deep -- these ones are such a pretty colour! I love looking at other peoples' books too, though I do wish mine were a little more "present" in the house. I have a room on the second floor we call the library and there are 4.5 bookcases in there and one outside in the hallway, so unless you know to go upstairs, you don't get to see all my pretty books! As for keeping books, I'm a wee bit of a hoarder, but I definitely can get rid of books. I actually have a bag I'm bringing to the meet up to pawn off onto you guys! I also donate some to the library, but those are usually the ones that I hated reading (like the Swoon series) and just want off my shelves. I wish I had more from when I was growing up, though. Yes! I can't wait to see your bag of books lol. I have some in my trunk too that you guys can have dibs on before I donate them! 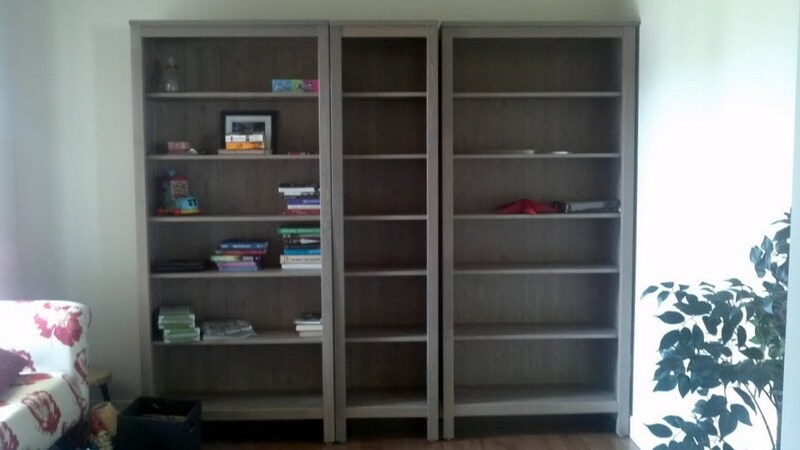 As far as how the books are arranged, right now we have three different spaces for our books. Upstairs in our sitting room, we have all of our hardcovers and the "smart" books I use to impress guests with my obvious intelligence. ;) I've also included some paperbacks that I love, mostly from certain fantay authors. Our office has all of our graphic novels and manga, and then in our downstairs bedroom, we have a bookshelf for any leftovers - the rest of our paperbacks, schoolbooks, and miscellaneous books that didn't make the cut for upstairs. Eventually, we'd like to have a floor-to-ceiling shelf (complete with ladder) built in our basement for all our books, dvds, and records, but for now, I'm loving my upstairs living room as our quasi-library. Also, floor-to-ceiling shelves with a ladder is my ultimate dream!! Did you put name plates in your books? Have you developed a lending system? 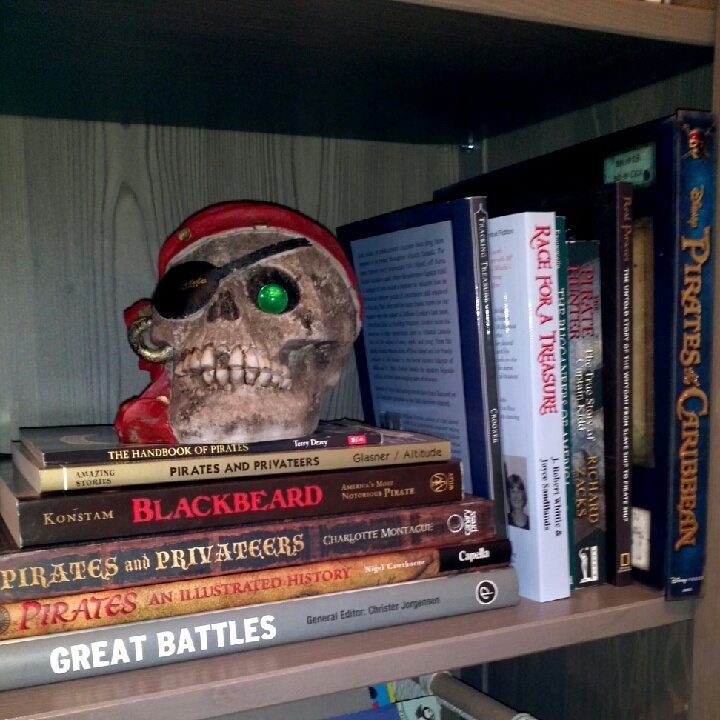 I've organized my books by subject (religion, biography, & made-into-movies are a few). I just have an ugly Ikea bookcase though, yours is so pretty! I have no lending system and I only recently started lending my books. Do you put name plates in? I've always wanted to organize by colour! I even have a picture pinned on pinterest of a bookshelf organized by the colours of the rainbow. Would you take off all the hardcover dust jackets then? I'd love to do that too one day. I like to move things around on my shelves, so I'm sure it won't be long before it's all disorganized too. Thanks, Ambur! This is the first time I've ever really organized them - it's a lot easier when you are taking them out of boxes to do so! This just reminded me that my husband actually took pictures of me amongst the stacks of books as I was organizing them into piles on the ground, oops. They won't stay this neat forever though, especially since I'm constantly accumulating more books! My books are shoved in a closet... I had a nice bookshelf set up in the old house, with little objects between books. I had mine arranged by appearance - hard covers, soft covers, by size and colour, etc. Well, what happened to the nice bookshelf??! 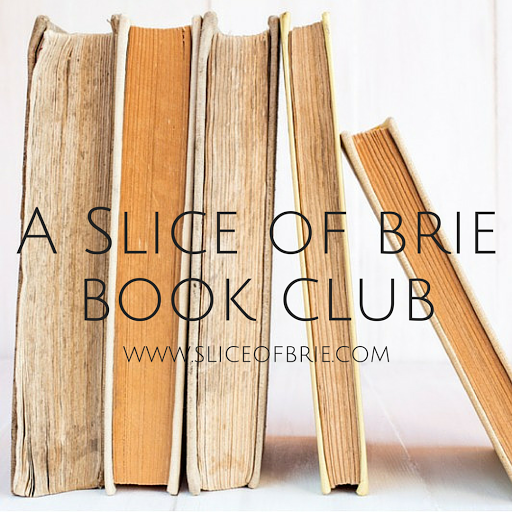 Did you get rid of most of your books? I definitely prefer to get my books from thrift stores when I can! And I've heard from a lot of my friends that e-readers are great for when breastfeeding. Makes sense! Will you be coming to the meet-up? I will have a box of books for you guys to go through and I'm pretty sure Kristilyn will too! Love them! It's always so nice when people add a few personal touches.